Famed and most visited for Siem Reap and UNESCO World Heritage Site Angkor Wat which many call a feat of planning and construction, Cambodia’s cities possess a wealth of stunning colonial buildings. Phnom Penh, Kep and Battambang feature many hidden gems and should be on the itinerary of your luxury Southeast Asia tours, especially if you are an architecture and history buff. 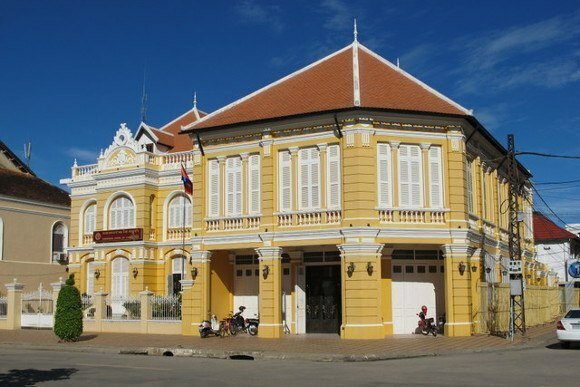 Discover Cambodia’s French colonial architecture with us! What used to be known as the Pearl of Asia has perhaps lost some of its lustre, but, one might say, Phnom Penh is a diamond in the rough. Gone are days of former colonial splendour, instead a faded version of its former glorious self remains, with only very few of the magnificent mansions built during the French protectorate still in good condition. 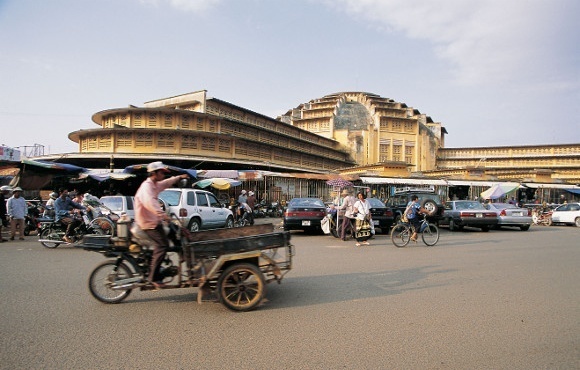 Reputedly once the most beautiful city in southeast Asia, Phnom Penh was damaged by the Khmer Rouge. During your luxury Asia tours, discover colonial villas, churches and boulevards built by the French, who ruled from the late 19th century to the 1940s. Deliciously decadent Raffles Hotel Le Royal wouldn’t look out of place on the chic avenues of Paris’ St. Germain! Owned by Raffles group – a byword for luxury, style and sophistication – it opened its doors in 1929 and has since played host to international glitterati with the likes of Jacqueline Onassis giving her stylish seal of approval. Psahr Thmey market is an impressive art deco structure and with Paris, alongside London and Vienna, having been the epicenter of the movement, who would be better equipped to build such a landmark than the French! Completed in 1937 – relatively late in art deco terms – the building is a masterpiece of the era with its symmetrical layout, clean, clear lines typical for the time and domed rotunda, rumored to be the largest in the world. Refurbished by the French Development Agency between 2009 to 2011, Psahr Thmey is one of the city’s key landmarks and remains a working market, selling a myriad of goods from food, clothes and souvenirs to electrical goods. Another fine and well-preserved example is the General Post Office, proudly standing in what used to be the French Quarter. Its claim to fame may be an appearance in the 2002 film City of Ghosts (starring Matt Dillon and Gerard Depardieu, nonetheless) but is worth a visit in its own right. Built in 1890, the building was given a full refurb in 2004 and now dominates this small square of other colonial buildings in various states of disrepair. The juxtaposition of regal yellow (in Europe, only buildings belonging to royalty were allowed to be painted yellow), Palladian influences and pillars versus huge, purple banners featuring Khmer text, make for a charming picture. Common amongst the Parisian ‘who’s who’ to summer in ultra-chic Deauville and Biarritz, naturally the colonial French elite built a summer resort in the pretty village of Kep-sur-Mer, some three hours drive from the capital. During the 1950s it became popular with wealthy locals who eventually made it their permanent home. In recent years Kep has seen major resurgence, holidaymakers from both Phnom Penh and further afield are rediscovering its charm, recalling its days as a jet-set hangout. 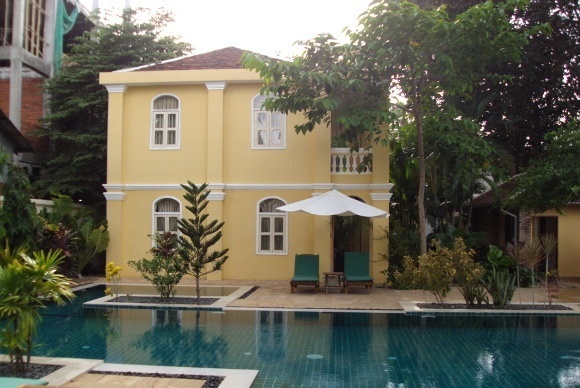 A few of the striking mansions have been modernised, mostly converted into hotels such as Knai Bang Chatt. Built by Vann Molyvann, a renowned Le Corbusier student, between 1962 and 1965, the site originally consisted of three villas. 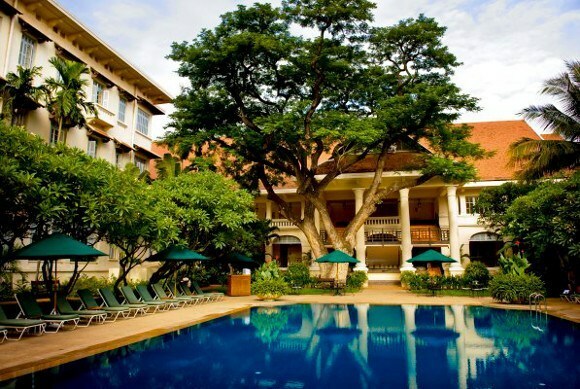 Its new owners, in partnership with a Phnom Penh-based, French architect, restored the compound to its former glory and added a fourth and fifth annex. Although built later, the buildings are an homage to the art deco era, their clean lines and pared down elegance exuding a calm atmosphere. From here, make sure to meander the streets of Kep with its large share of colonial mansions – it is said in excess of 500 were built. Sadly many are now beyond repair but with a little imagination you can reminisce of the days when Kep-sur-Mer was the height of sophistication. Cambodia’s second city Battambang, boasts some of the finest and best preserved collection of colonial architectural delights, many of which were painstakingly and lovingly restored in recent years. 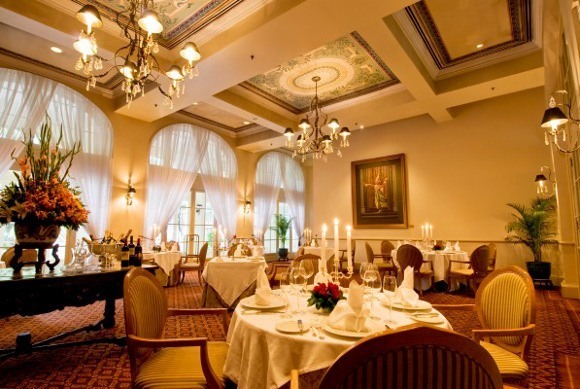 Although not built by the French, Sala Khaet is a must-visit during luxury Asia tours. Commissioned by the last Lord Governor of Battambang, Lord Chhum, it was designed by a prominent Bangkok-based, Italian architect. Unfortunately you are unable to marvel at the five-meter high ceilings, sweeping staircases and ornate interiors as Sala Khaet is the seat of the Provincial Governor and not open to the public. Lord Chum never got to live in his glorious mansion due to the Franco-Siamese Treaty of 1904 that saw the city returned to Cambodia. Chhum moved across the border to Prachinburi, Thailand, where he hired the same architect to build a copy of Sala Khaet. Battambang today houses the Museum of Traditional Thai Medicine, which is a worthwhile visit in its own right when visiting Thailand. Also take in the National Bank of Cambodia, a stunning and fully restored corner villa that previously housed a pawn shop and radio station. On the western side of the center you will find Psahr Nath market, built by the same architect ten years prior as its counterpart in Phnom Penh, Psahr Thmey. If all the visual stimulation inspired you and you would like to experience colonial living first hand, check into La Villa Hotel. 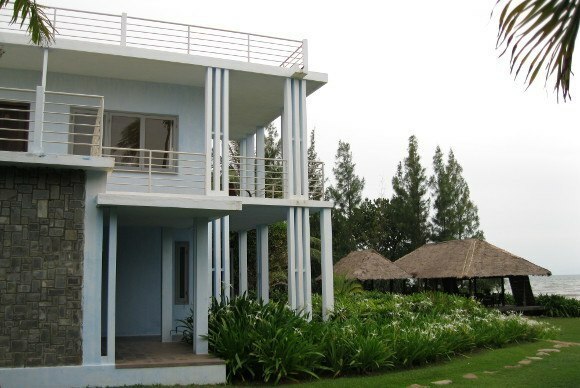 This is a beautiful 1930s house set on the banks of Tonle Sap River and is perfect for resting your head in during luxury Asia tours. Bought by an expat couple and sympathetically restored, it is furnished with exquisite art deco furniture. With such wealth of stunning architecture, it seems a shame to disregard the buildings’ heritage, neglecting them beyond repair until torn down. Replacing these wonderful villas with a high rise of questionable quality and design appears to be be a common issue in Cambodia. 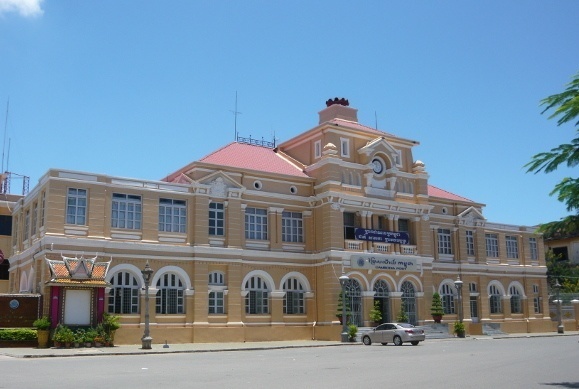 Neighboring Vietnam and Laos have by now recognized the importance and value of their colonial pasts and seen a way of making the buildings work, earning their keep. Whether Hollywood’s film industry and its enormous budgets pumping millions into their economies, museums, cafes or hotels – opportunity lends itself to restore rather than destroy, giving old buildings a new lease of life. Luckily more and more organizations such as Heritage Watch realize the importance of their history and future potential. Apart from adding charm and a unique atmosphere to cityscapes, preserving your past will help in educating the next generation. Interested in exploring Cambodia, its rich heritage and stunning architecture? We would be delighted to assist with creating your perfect trip.